I’ve been trying out all sorts of new stuff recently to make me go faster and I ran across an amazing fact I had no idea of before: good cyclists don’t just push down on their pedals; they also pull on them! Well, sort of. 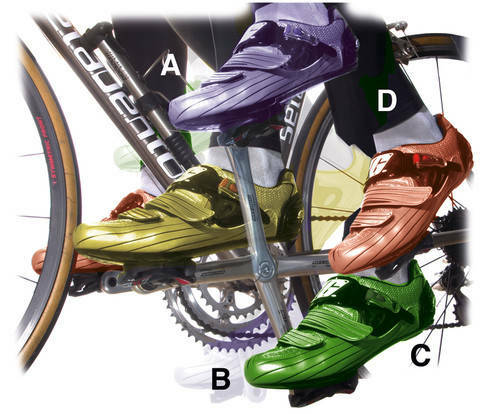 I didn’t really understand the concept the first few rides I tried it and I ended up pulling back (from the green shoe to the red one in the diagram below) with my heel, if you follow. The result was that I was not doing anything good to my knee and it just felt all wrong. Then the other day I went out with John for a spin and he said that he’d heard the technique was like wiping mud off the bottom of your shoe (I discovered later that it was Greg Lemond who first came up with this simple, descriptive way to explain it) and since then it has gotten a lot easier. Still though, it’s a weird sensation after all these years of riding. At first I was wobbling all over the place trying to get the technique down, then I would just simply forget to do it! I’m convinced that this will give me an edge (over who I don’t know, since everybody else is probably already doing it…) once I master it because when I’m concentrating the speed goes up immediately and pedaling becomes a bit easier. That’s old school…. why did you think that they were attached to the pedal? even old fat guys who gave up cycling when unicycling was vogue knew that LOL…. Thanks for the link. I found it the other day while looking around. Yes indeed, I have a lot to learn…in a short amount of time. And I have the weight to go fast on the descents! Like you, I always thought you were supposed to pull on the upstroke and saw a big improvement when I started doing it (more) correctly. I also tend to forget to do the technique. It really helps me when I’m starting to tire and need a little extra to maintain my pace. Some day, I’ll start doing it correctly all the time! Gerry, you are a Legend! First for your awesome blog, which as Aussie’s who are lucky enough to own a home in a gorgeous Languedoc village, you help us with our “home sickness”, Secondly for finding the best description of how to pedal properly (tried it this morning on our Brisbane River loop ride – brilliant) will now adopt ridiculous walking style to practice new found knowledge, and Thirdly for admitting that you did not know that pulling up on the pedals could be done with clip pedals! We have been meaning to add a comment to your blog for a while now, but all morning on the ride I knew I HAD to! Keep up the great work, I check every morning before work to seek some inspiration! Hahaha! Love Australia, by the way. Have done a couple of long tours there, but none up your way. Great riding, but you need more towns, man…you have some severe distances between water bottles refills! Give me a shout when you’re here and maybe we can do a ride or two. Hi Gerry, so nice of you to reply! Our place is in a little village just north of Beziers, called St Genies de Fontedit. We did a little exploring when we were there last time, on some pretty rugged mountain bikes we bought to keep there, but are in training to do a bit more. A ride with you (and Shoko!) would be fantastic, if we can manage it. Actually your blog is similar to the Tour de France TV coverage, half of it is about the cycling, and the other half is about the region! On the TdF, we are bloody excited that the route will pass by St G, so no surprises that we will be there for that! You mention the distances between watering holes, and it is one thing we love there, how close everything is. What we consider “down the road” is a week away there!